The formal election and referendum results were published on Friday, bringing bad news for Geert Wilders and the anti-Islam PVV. 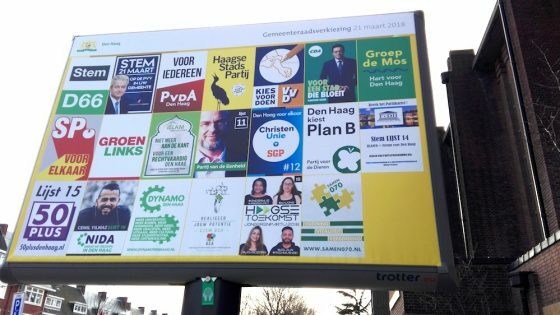 When the final calculations were made in Rotterdam, it transpired that the PVV only had enough votes to merit one seat on the 45-seat city council. The PVV’s arch rival Denk was the beneficiary and now has four seats on the city council, rather than three. Denk’s local leader Stephan van Baarle told reporters that the party should now be invited to take part in the coalition talks. In The Hague, local populist party Groep de Mos also lost one seat in the final count, but remains the biggest party with eight seats. The extra seat goes to local grouping Haagse Stadspartij. Also in The Hague, local personality Henk Bres, who was reportedly sacked as a columnist earlier this year for sending out racist tweets such as ‘cancer Muslims’, was elected to the city council for the PVV on preference votes. In Emmen, Labour candidate Ugbaad Kilincci, who stopped campaigning in public after a string of racist comments, was also elected to the town council on the back of preference votes. Kilincci, who was told during campaigning that she was a ‘black monkey’ and should go back to Africa, was 12th on Labour’s candidate list but will now take one of Labour’s four seats in Emmen. The ‘vote for a woman’ campaign is also claiming victory in the local elections after dozens of female candidates were able to leapfrog up the party lists on preference votes. In Voorschoten, Smallingerland and a string of other towns and cities, women were elected as councillors on preference votes. In Amsterdam, support for the PvdA may have halved, but local party leader Marjolein Moorman got more votes than anyone else fighting for a seat in the city – 25,430. And Femke Roosma, number two on the GroenLinks list, got more votes than party leader Rutger Groot Wassink. Recounts are taking place in up to eight local authority areas. In Maastricht, for example, D66 came just two votes short of an extra seat and has requested a recount. In Venray, the CDA and Venray Lokaal both got exactly the same number of votes and are competing for one seat.